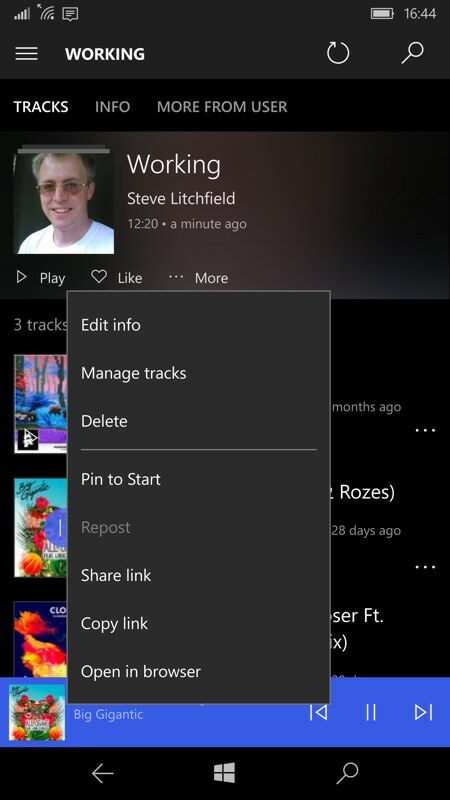 AudioCloud isn't a new name in Windows Phone circles, it's been a very competent SoundCloud client for years - but the latest update is a rewrite and a Universal Windows Platform app, continuing the smooth flow of these, and running on anything that's 'Windows 10' or Continuum. 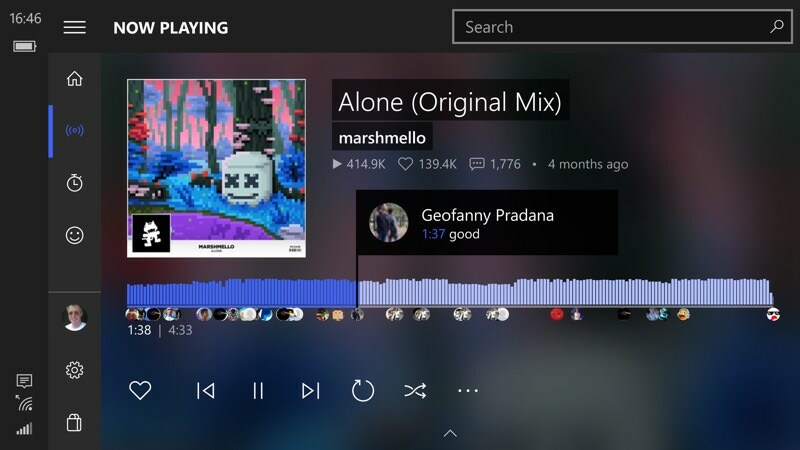 It's flawless too, both in UI and performance, and the best and most interactive way to discover new music and new sounds. 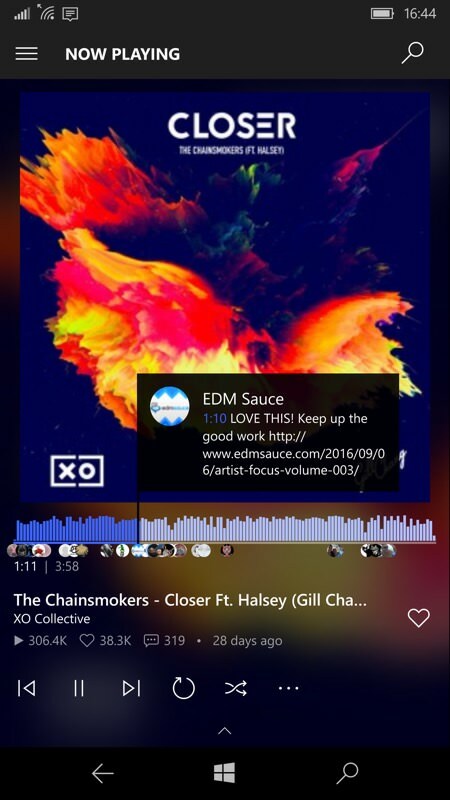 Audiocloud is a music discovery, playlist curation and streaming audio app powered by SoundCloud. 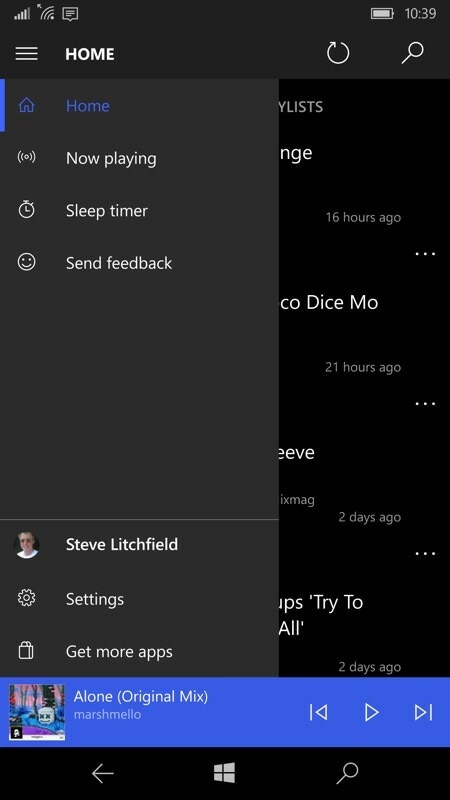 Experience advanced features such as gapless playback, playback speed control, sleep timer, drag-and-drop playlist management, Cortana voice commands and Live Tile integration! 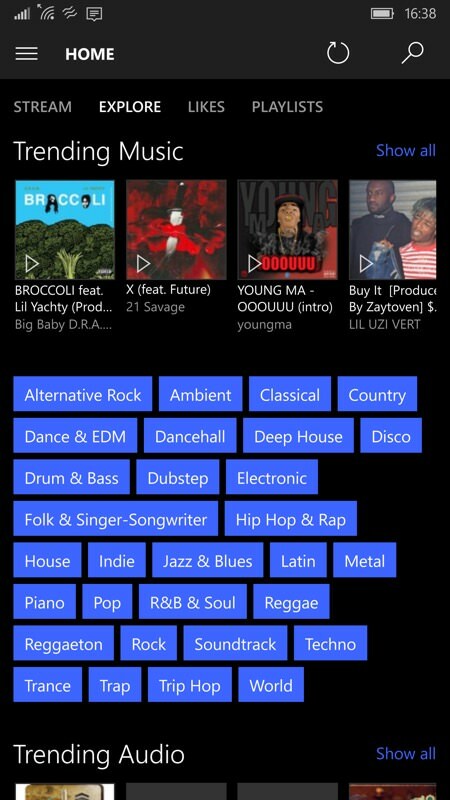 You're encouraged to explore with pivot panes, trending music picks and, best of all, up front genre tags; (right) straight into playing a track and the waveform doubles as the play position indicator (just as on SoundCloud on the web) - you can drag this around to skip through the track as needed, while comments from others pop up on top of the track's artwork, which can add to the entertainment experience. It's trivial to add tracks you like to a new playlist and then to edit this playlist later on. 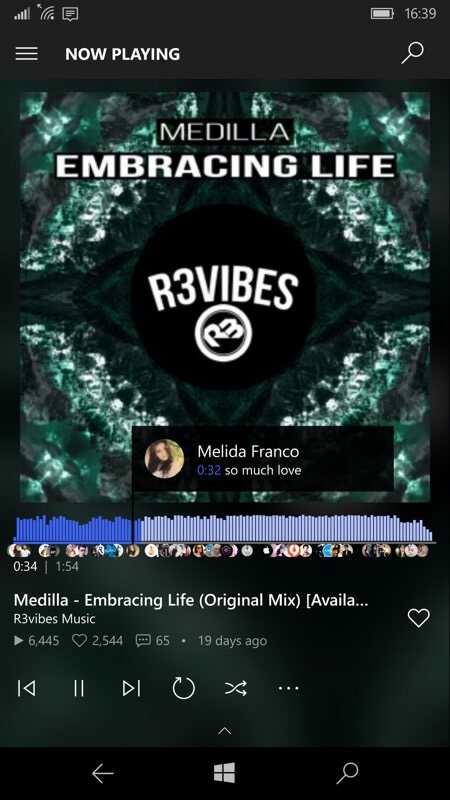 I was queuing up something ambient and electronic to play while I wrote! 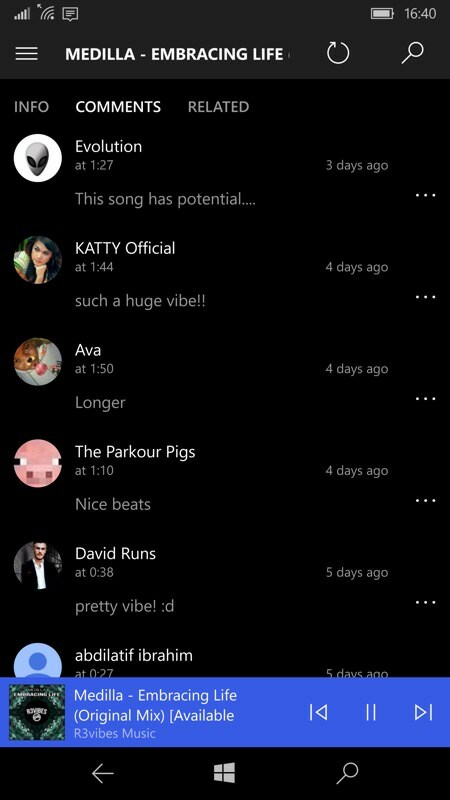 The comments system is really what makes this all special though and it's easy to add your own comment at any particular playback position, all without stopping playback of the music (the initial tap point will be used for when others should see your comment). 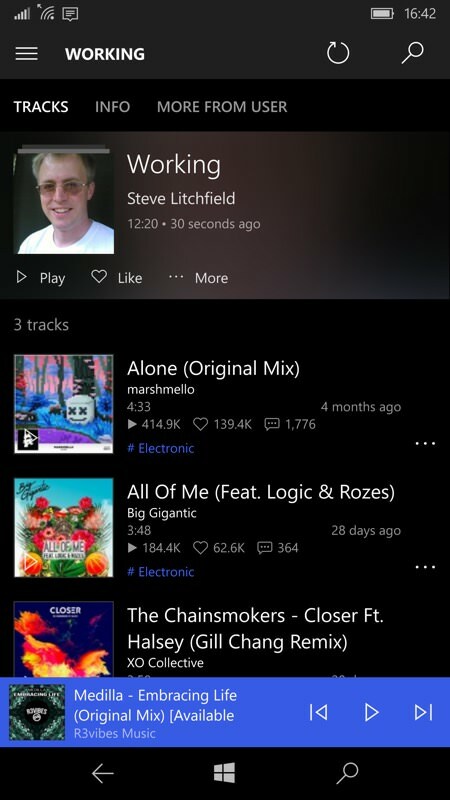 Proficient and effective SoundCloud producers will have extensive notes and social hyperlinks in order to build an audience, here's a great example; (right) the UI design (modelled on Groove Music), colour, backgrounds and controls are all just perfect. 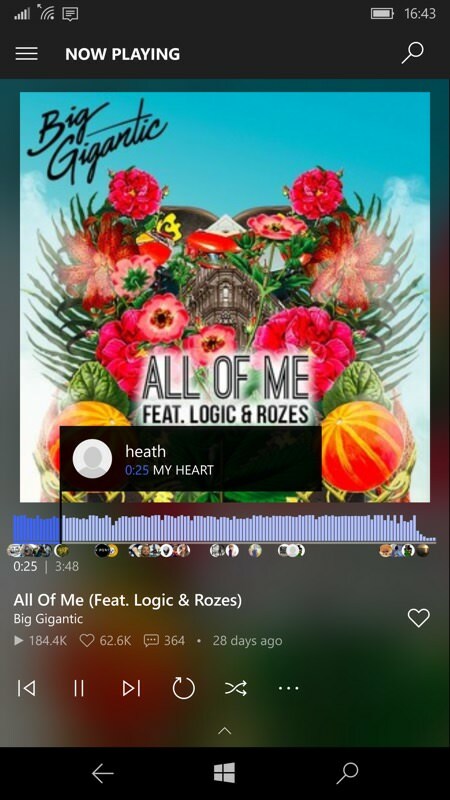 The hamburger menu isn't needed very often (which is how it should be), but does offer a quick way home or to the 'now playing' track, in case you get buried too far in a comments section (or whatever). 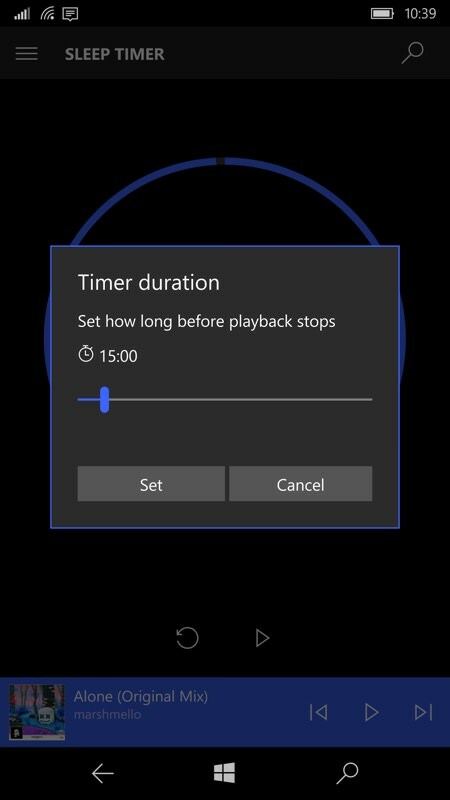 Plus you get (right) this handy sleep timer, shutting off playback of a playlist after the set number of miniutes, to save your battery while you snore. (I guess your phone might be plugged in and charging while you sleep, but sthis still stops you missing too much (it might be a podcast and not music) and it also stops you waking up, disorientated at 3am with a little 'tsk tsk' noise coming from your (fallen out) headphones! 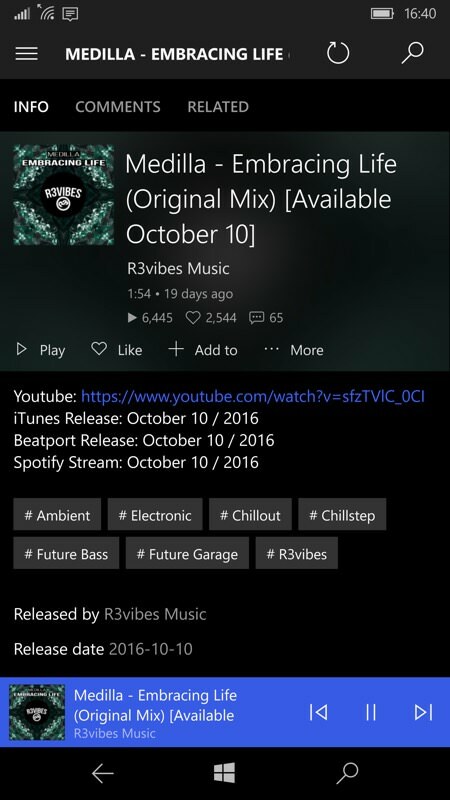 Just proving that AudioCloud is now a full UWP for Windows 10 devices, with the UI transforming appropriately. 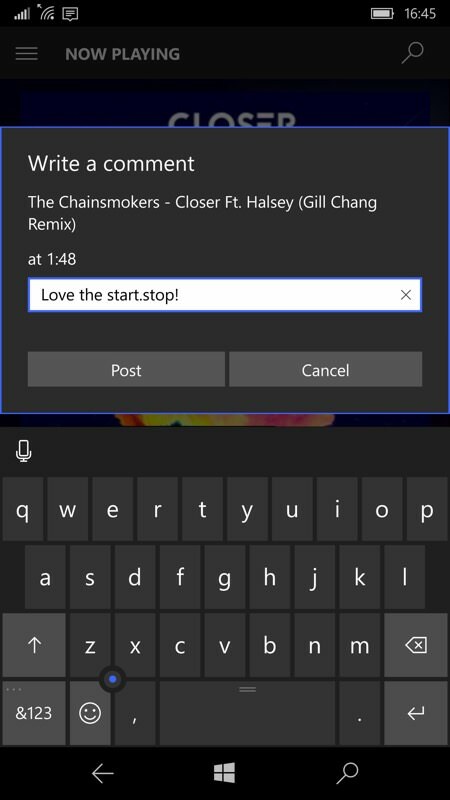 And in either aspect ratio you can, of course, swipe away the Windows navigation controls. 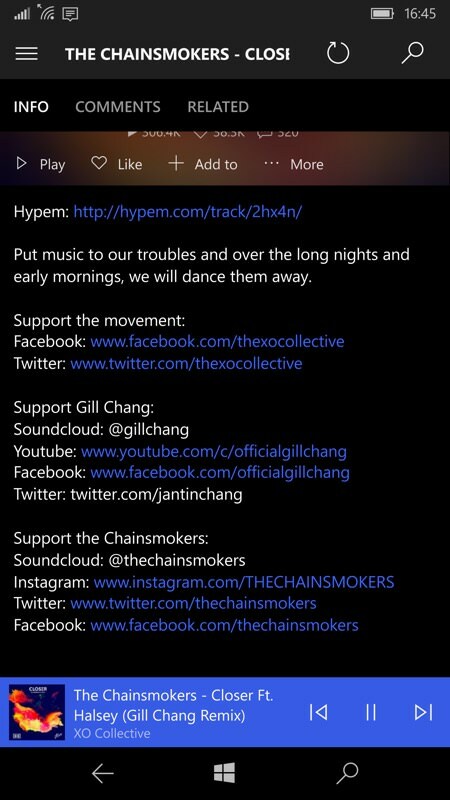 Highly recommended, you can grab AudioCloud here in the Store.